The Wichita-Sedgwick County Historical Museum Association owes its inception to the foresight of the Sedgwick County Pioneer Society, founded in 1919 by Mrs. George Whitney. Fast disappearing were the anecdotes and artifacts relating to the origins and development of the “Peerless Princess of the Plains.” The Pioneer Society collected and housed artifacts in the Sedgwick County Courthouse and sponsored an annual picnic reunion. 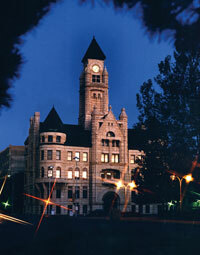 By 1938 the need for a historical museum was met by the establishment of the Wichita Public Museum. The Pioneer Society collection was moved from the courthouse to the hallway above the main entrance to the Forum in 1939. In 1947 the museum adopted the name Wichita Historical Museum Association. 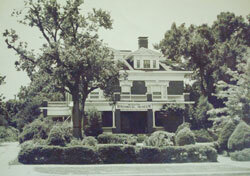 In 1955 Mrs. Cyrus M. Beachy, whose collection of antiques and dolls constituted a private museum in itself, left her home at 3751 East Douglas to the Association. The combined collections from the Forum and Mrs. Beachy’s estate opened in May 1957. The idea of creating a new historical museum in the City Building emerged in the 1960s when plans to build a new City Hall left the future of the 1890 structure in doubt. Public support for preserving the building led to a commitment by the City Commission in 1969 that the City Building be maintained for the benefit of the community. Listed on the National Register of Historic Places in 1971 and designated a local historic landmark in 1975, the building was scheduled for major renovation as soon as city offices moved to new quarters in November 1975. In August 1976 a lease agreement was signed between the museum and the city, confirming city maintenance of the structure with the museum responsible for installing and operating its own facilities and programs. City funds for the structural renovation were supplemented by federal aid, bringing the total to $1.3 million. Upon completion of this work in the fall of 1978, the museum began its task of finishing the interior and constructing exhibits, offices, and storage areas. Over $500,000 in private donations were raised for this phase of the project. The museum remained in its East Douglas location until the summer of 1979, when the move to the City Building was accomplished. Opening of the new museum on May 3, 1981, represented the vision and dedication of friends, public officials, and staff who assisted in this significant step in the growth of the museum. The “Palace of the Plains,” a striking example of the work of architects Willis Proudfoot and George Bird, was Wichita’s pride and joy when completed in 1892. After years of renting space for city offices and following a controversy surrounding the choice of a site, Wichita’s new City Building was meant to be a symbol of the prosperity of the 1880s. However, it was constructed during a recession that left the clock tower vacant for years. At a total cost of $100,000, the new structure proved a good investment for the city, even though bonds for the construction were not paid off until 1928. 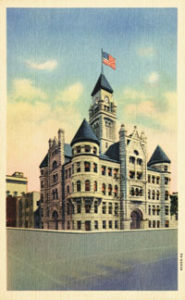 All city offices, including the police and fire departments and Wichita’s first public library, were housed in the building. Over the years many changes were made in the interior space, with major remodeling occurring in 1912 and 1940. The tower clock was added in 1917 along with the 1,000-pound bell, and in the 1950s the carillon was installed. The building continues as a beacon of historic preservation in downtown Wichita and serves as the museum’s premier artifact. The museum collection has evolved from a core of early memorabilia to over 80,000 artifacts relating to Wichita and Sedgwick County from 1865 to the present. From photographs to fashions, business records to furniture, these items help to tell the story of the people and events that have shaped our place in time today. In addition to the professional staff, members volunteer to host events, guide tours, and operate the gift shop. The Wichita Historical Museum Society, known as WHiMS, sponsors special events to support the museum, and friends are welcome to participate in these activities to further our purpose of preserving and sharing our city’s heritage.